Madison has always been a baby who ate almost anything. However, now that she's older she's very picky about what she eats. I remember once as a baby she had an upset stomach and being the mom that I am, I immediately took her to her pediatrician. I was reassured that she would be ok, it was nothing to worry about and was asked whether or not I was giving her probiotics? My response "no". After all she was about 6 months old and I was of the opinion that it wasn't needed or even necessary. Her doctor advised that it was a good idea to give her a probiotic which will help with her little tummy and also keep her regular. So for the past almost 5 years, Madison and myself have been using a probiotic. Today I want to share with you three reasons they're important, and why your kids should be taking them. 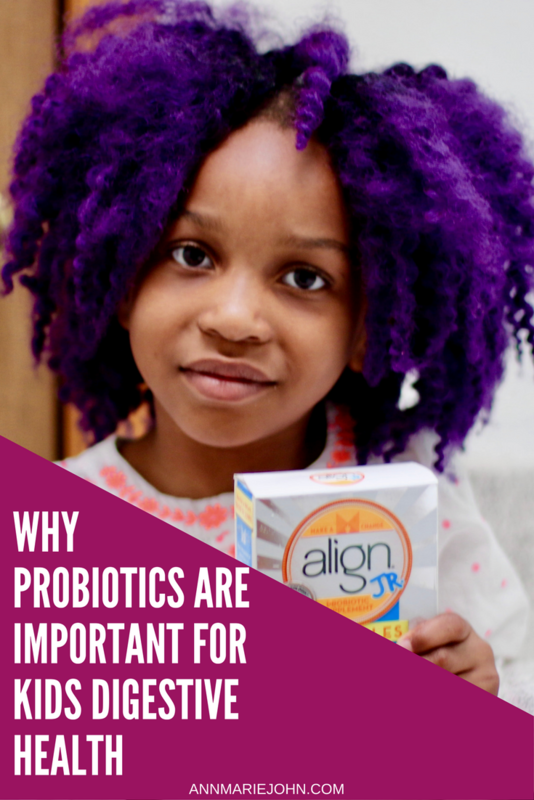 Now while you can get probiotics from items such as yogurt, giving your kids a chewable supplement such as Align Jr. (by the makers of Align, the #1 Doctor and Gastroenterologist-recommended probiotic brand‡) is a lot easier, and may be one of the best things that you can do for yourself and your kids digestive system. Madison and I have been using Align Jr. and Align for ourselves, and I can't recommend them enough. 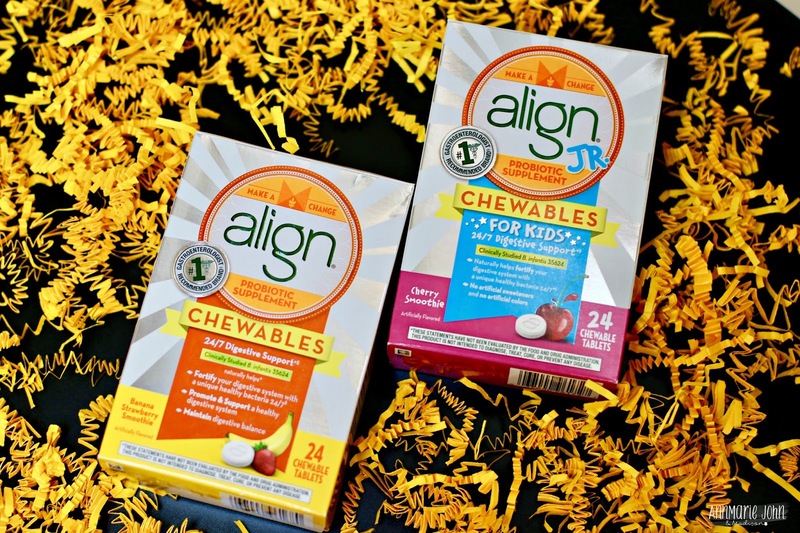 Align Jr. comes in a chewable cherry smoothie flavored tablet form for kids and according to Madison tastes "Super Good". With Madison in pre-school it can be difficult at times to regulate what she eats. In a pre-school setting I also have to worry about other sick children coming to school and we know that kids love to share, the good and the not so good stuff. Colds and upset stomachs are usually my main enemies, but they're not the only thing that can cause her digestive system to go awry. A slight change in her schedule or even her diet can disrupt her natural balance of good bacteria. That's where a probiotic supplement comes in handy. Let's face it - no matter how many times they wash their hands, eat healthy food, fruits and veggies, no matter how much you sanitize - our kids are going to get sick. So here are 3 reasons why you should give your children a probiotic. 1. Helps Fortify their Digestive System - When taken daily, probiotic supplements helps to fortify their digestive system with healthy bacteria that they need 24/7. 2. Required Dosage of Beneficial and Good Bacteria. While as I mentioned you can get it from foods such as yogurt, taking a supplement gives you the dosage that you need throughout the day. Stress, change of diet and schedule can disrupt the good bacteria in your body, taking a probiotic supplement can counteract that*. 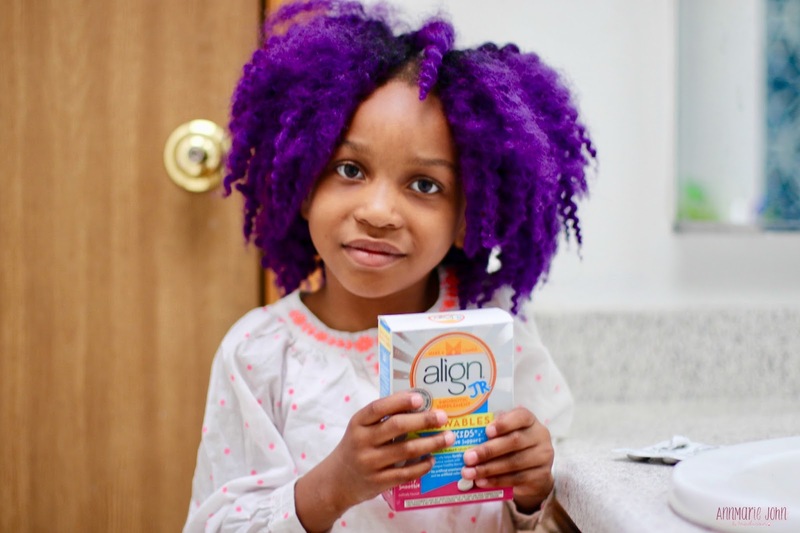 If you're never considered giving your kids a probiotic, I suggest starting them with Align Jr., and to get you on your way, here is a $5 off coupon. Don't forget to get your own Align probiotic as well. The family that probiotic together, live healthier lives together. 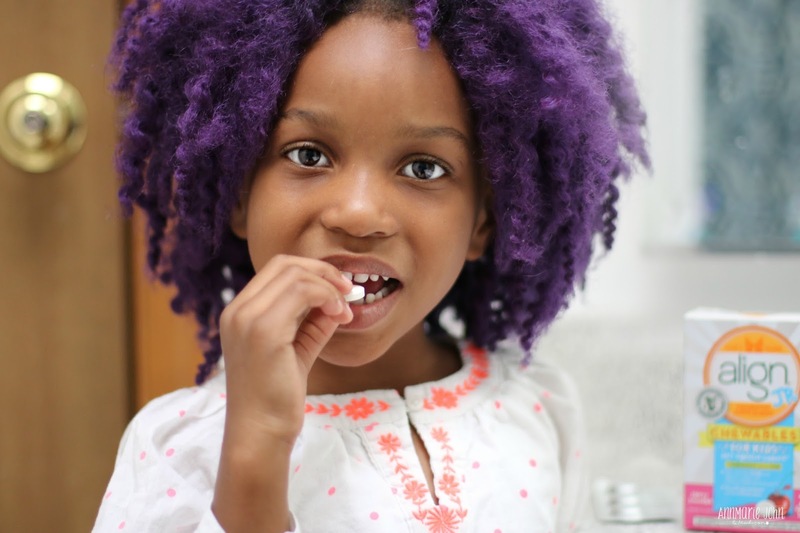 Let's discuss: Have you considered taking a probiotic for your kids or yourself? Des was on infant probiotics and then toddler ones. I do them daily. I think it's crucial! I can't wait to check out this brand. He outgrew the gut problems he had from antibiotics at birth, but that doesn't mean I don't think they're important. This is great information. People forget that young GI tracts need beneficial bacteria just as much as grown up GI tracts. Everyone in our family takes a probiotic, including the kids. Probiotics can do wonders for your overall health. Thanks for the info! I have been considering starting probiotics for my kids but wasn't sure where to start. I take probiotics ever day and am just starting to introduce them to my son, this is a perfectly timed article for me! Thanks! I have not heard of this particular brand yet. I am going to have to try to find them in my local store to check them out. I started on probiotics when I was diagnosed with an auto immune disorder and I have felt such a difference. This is all great information! I had my kids on different probiotics throughout their childhood. This sounds like a great product- even better when the kids enjoy taking it. My granddaughter has a really sensitive stomach. I bet a good probiotic would help her out. Having a healthy digestive system should definitely be a priority. These are great reasons! I love that they have probiotics for kids! Probiotics have been great for my daughter! I take one as well, and I know I can feel a difference. This is such an important post. I give my children probiotics all the time, especially now with cold and flu season. I have recently been thinking of starting my kids on a probiotic. I am going to check out this brand, i think this will benefit them in so many ways! Your daughter is adorable and a Mini-Me! Learned a lot from this post. Will have my daughter take these as she has an immune disorder. My daughter started withholding her poop when she was 1 year old so I started giving her probiotics to help keep her regular. Such a great post! I have been really interested in probiotics for myself and my kids. I will have to check out this one. We are an Align Jr. family too. It's a small and easy way to look after my family's health. I totally agree. I think they are very important. My daughter takes a probiotics. I think taking probiotics would benefit people of all ages (maybe with the exception of newborns). An abundance of good bacteria in our intestines is the best way to fight off the harmful ones and it also helps break down the food we eat for better absorption. Me and my children take probiotics supplements and it is amazing how it kept us healthy. This is great to know! I love that they have chewables for kids. Thank you so much for sharing. i agree with this post! not only for the kids but also to us adults! lol. btw, i love your hair color! I have considered probiotics as I have heard good things about them clearing out your digestive system. Your daughter looks so cute in pictures! I have been thinking of adding a probiotic to my family's routine. I will have to look for these tomorrow when I go shopping. We give our baby probiotics everyday and it has made such a difference! Omg she has purple crochet hair! Wow that is bold and brave for her age but thanks for teaching me the importance of probiotics for kids. All 3 of my kids have been sick and missed school the last 2 weeks. I am going to seriously look at adding probiotics to our diet. I absolutely love that you and your little have matching hair! That's the cutest thing ever! I love a good probiotic! My little takes the one from Honest and we love it! I never knew that they made products like this for the kids. I am going to have to look into getting some of these! I totally agree with this. I that if I had taken probiotics as a kid I wouldnt be sick as often as I was. Yes! We all take probiotics here - and also try to eat a lot of fermented foods like kimchi which also includes probiotics. It is such an important supplement!